​Are you having a home built? Do you have a wooden deck? If you are having a home built or you have a wooden deck, you should be concerned about termites. Termites live inside wood. Once they begin eating the wood, this could leave your deck hollow; which is dangerous. Unfortunately, you may not find out that you have termites until an incident has occurred. Our Pest Control Summerville SC is able to prevent anything from occurring due to a termite infestation. Our pest control experts know how to find your problem and get rid of them as quickly as possible. When you utilize the services of a pest control service, you can avoid the misfortune that comes from an infestation developing. Exterminators are aware of the habits of termites and what they are drawn to. This is how they are capable of finding the source of your problem and getting rid of them for you before they turn into a much bigger problem. A termite infestation might exist within various areas of your home. While you may be aware of termites in one area of your home, a professional exterminator is capable of discovering other areas of your home that may be infested. With the right type of commercial pest control products, we are able to completely eliminate the problem. Termites are destructive because they compromise your home's foundation. When they begin chewing on your wood, it weakens the structure. This could cause parts of your home to collapse. Also, termites chew through wiring, which can further complicate the situation. They have been the cause of house fires, which makes them a serious threat to your home and your well-being. This is certainly reason enough to contact Summerville Pest Control Service. If you notice wood chips or saw dust, you might consider the possibility of termites being present in your home. You may also notice the tubes that they make in order to tunnel through your home. They also shed their wings and this is a sign of termites. 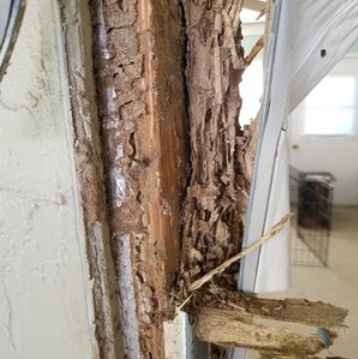 While termites are very hard to see, sometimes our customers are able to spot them right away. They are pale in color and are only about ¼ to ½ inch long. The king and queen termites are a little larger, they can get as long as an inch long. You can control a termite infestation by contacting Summerville Pest Control Service at the first sign of them. This is something that can’t be stressed. If you do not get this problem under control, they can cost you dearly. The problem could spread making it much more difficult to treat. In addition to the cost associated with treating the problem, you may also notice that the termites are destroying parts of your home and they need to be eliminated quickly so that they do not cause any further damages. Our exterminators are successful in controlling the problem.